So I came across this really cool idea and thought I would try it out! It’s basically a mailbox…for the family! The more i thought about it, i realised it could have many uses…as well as encouraging writing skills and all the other bonuses talked about in the blog, I thought why not use it to encourage the children to write to Allah too? To help them put their thoughts into words – sort of like an Ariza but all year round. As it is Laylatul Qadr, I figured I would share it with y’all as what better time to write to Allah than this night – the best of nights of the best of months! 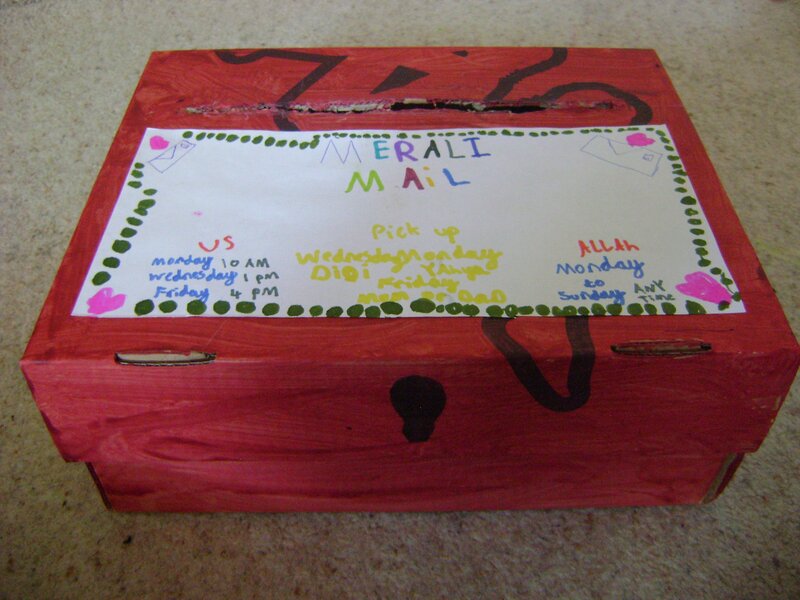 We just used an old shoebox, painted it red, cut a slit and wrote out essential information – like who gets to be the postman, and when pick up times are! The kids also made stamps to stick on the letters they post. So far, the children (and us!) have been very enthusiastic about posting, even if it’s just a small note or a drawing. Do let us know if you try it out, or even just what you think!